NJ, NY, NYC, and PA.
Richmond Recycling is one of the largest quarry process suppliers in Staten Island Our quarry process is approved by the NY Department Of Transportation. Quarry process is an aggregate size that has been crushed, reduced in size and screened through a 1” square screen. Quarry process is also referred to as QP, Dense Grade Aggregate (DGA), Shoulder Stone, Item #4, Crusher Run and DGABC. Aggregates range in size from 3/4” through to a #200 sieve. 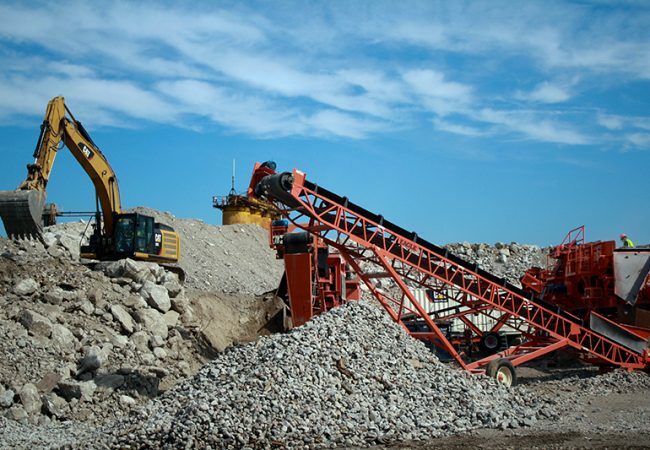 Quarry process is composed mostly of 3/4 minus crushed stone in a blend of stone dust this is graded enough to produce a low void content at the maximum weight when it is compacted. This aggregate is sold by the cubic yard or by the ton, depending on where it was loaded. Richmond Recycling supplies quarry materials for use on homeowner projects as well as construction aggregate for road construction and highway base. Quarry process can be made up of trap rock, granite, gneiss or limestone. The final product is produced by crushing through a series of crushers then screening it to size.